Here are the 3 shades I picked up from Sally Hansen's Fall LE Insta-Dri Collection, which includes a total of 8 shades. There were some berry and purple cremes and shimmers, and another silver metallic shade, if I remember correctly. These can be found in a tabletop display that also holds some Lip Inflation glosses in similar tones. 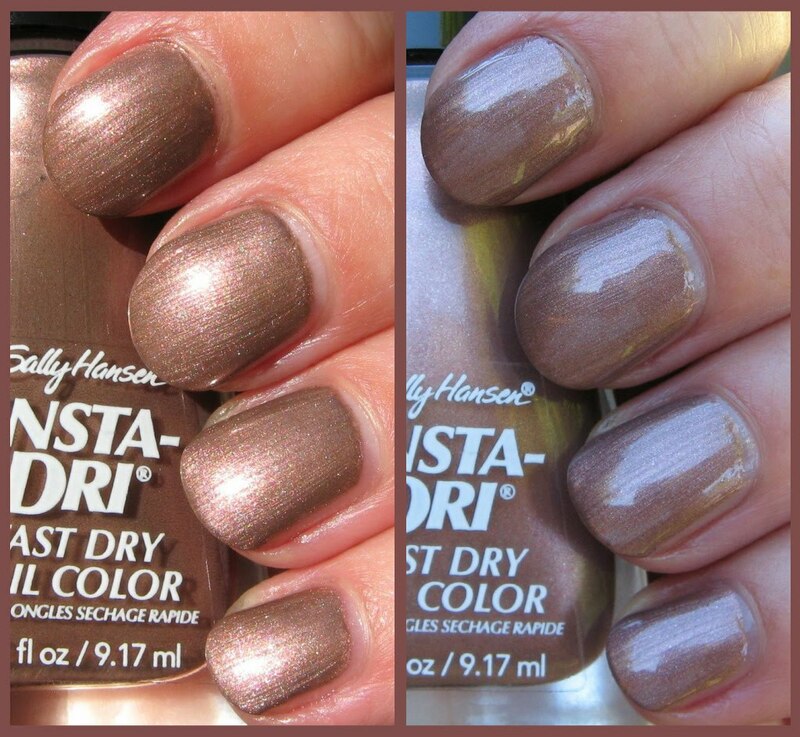 Above: Instant Coffee is a darker taupe shimmer with tiny multi color glitter. There is the slightest hint of bronze in there as well. It has a more metallic look in brighter lighting, and more of a shimmer appearance in lower lighting. Below: Golden Flash, a pink/peach/gold shimmer with mainly gold glitter also has a metallic look in brighter lighting. In lower lighting, the glitter combined with the base shade gives a soft, textured plush look. Below: Metallic Momentum is another metallic type finish with silver glitter. This somewhat foil-like shade is a medium silver tone that reminds me in color of the back side of aluminum foil, if that makes sense! I like these, buy I don't think they're anything that screams "I need these now". 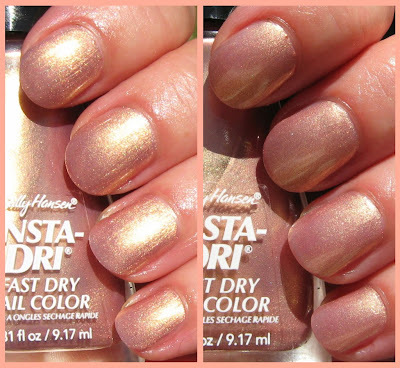 I'm getting critical lately with all of the newer polishes, probably because it seems like there's a dupe for almost every one of them. Instant Coffee reminds me of another Sally Hansen that I showed you yesterday, Shining Moment. Golden Flash reminds me somewhat of Nox Twilight Debutante, and Metallic Momentum is similar to many other silver metallic shades. That's not to say if you don't already have something similar that you may like them, that's just my perspective. I used 2 coats on these and had no problems with the formula. The Insta-Dri polishes have the wide tapered brush, much like the Sally Hansen Complete Salon line. These are available for a limited time at retail drug store chains such as Rite-Aid and Walgreens for about $4.50 each. Is Metallic Momentum a dupe for CC Snakeskin? I really like Golden Flash. Those polishes with the golden shimmer really get to me. I'm not going to buy this. I do have plenty of polishes like these. Metallic Momentum I have many like it. ~Elizabeth-no, I wouldn't say it is. 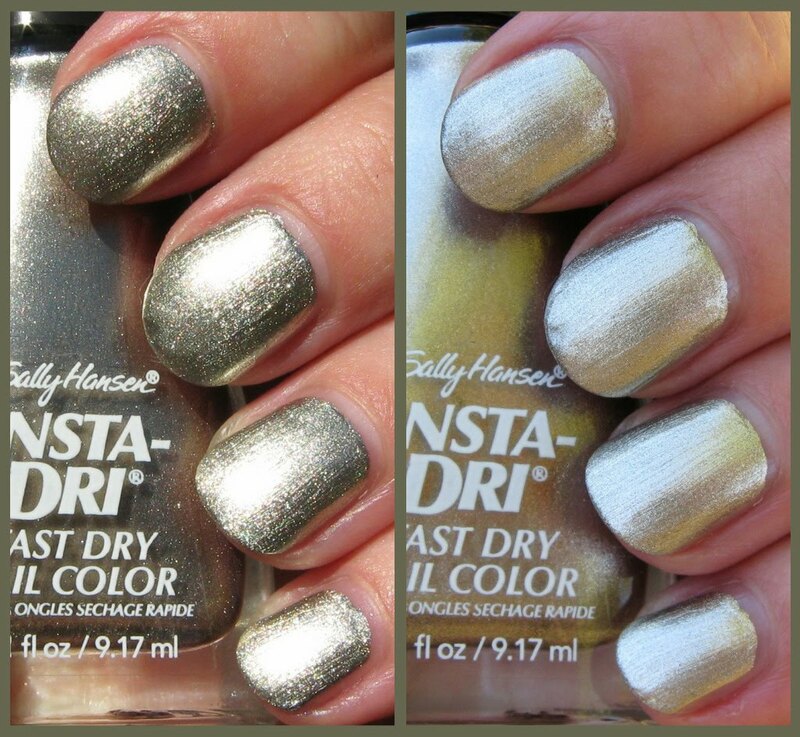 Snakeskin is a darker shade of gray and in my opinion, there's olive green and gold in that, whereas Metallic Momentum is basically a straight silvery/gray with lighter silvery glitter. I see no trace of the olive or gold that I do in Snakeskin. Hope that helps! If you need me to do a comparison, just let me know. I really like Golden Flash! I like Golden Flash the best,but like you said they're not really screaming "I need these now." Besides, I am really waiting to see what the fall HD's will look like! I really like Instant Coffee and Golden Flash.